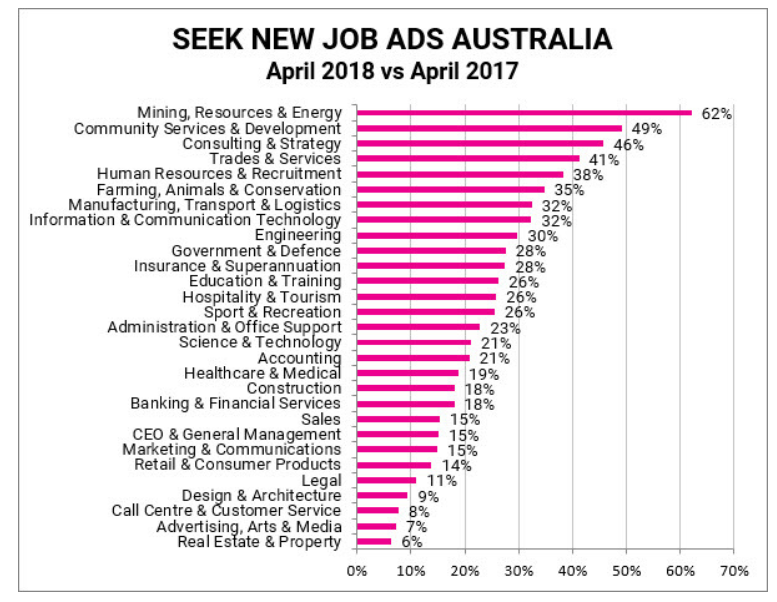 The Mining, Resources and Energy industry topped year-on-year growth in Seek job ads in April 2018 (compared to April 2017). THE mining, resources and energy industry has clearly led the way for jobs growth in the past year, according to figures released by online employment market SEEK. Jobs in the mining, resources and energy sector have surged in the past year, with a spectacular 62 per cent increase from April 2017 to April 2018. In a positive sign for the industry, SEEK statistics showed mining, resources and energy jobs growth was 13 per cent ahead of any other industry. “New job ads in Mining, Resources & Energy increased across all states with Queensland (91% YoY), Victoria (86% YoY) and New South Wales (62% YoY) driving growth in the sector,” Kendra Banks, Managing Director SEEK ANZ, said. National new job ads recorded a rise of 16.5 per cent in April compared to this time last year, and experienced modest month-on-month growth of 1 per cent.